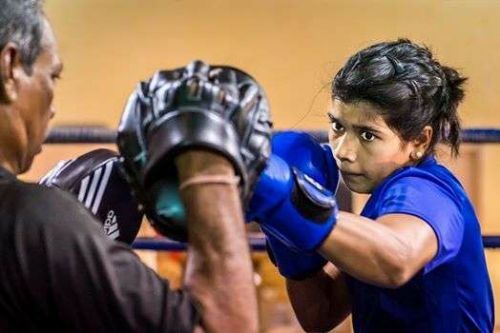 New Delhi, Feb 19 (PTI) Former junior world champion Nikhat Zareen and Meena Kumari Devi Tuesday became the first set of Indian women boxers to notch up gold medals at the Strandja Memorial Tournament in Sofia, Bulgaria. Zareen, a multiple-time national medallist, claimed a 5-0 win in the 51kg category finals against Filipino Irish Magno, while Devi got the better of Aira Villegas 3-2, also from the Philippines, in the bantamweight (54kg) summit clash. The previous best by an Indian woman boxer at the event was the silver won by the legendary MC Mary Kom (48kg) last year. "I dedicate this medal to the martyrs of the Pulwama terror attack. It was a very sad day for us as a country," Zareen told PTI over the phone from Sofia referring to last week's terrorist attack that killed 40 CRPF personnel in Jammu and Kashmir. However, Manju Rani (48kg) settled for a silver after going down to another Filipino in Josie Gabuco in a split 2-3 verdict. In a commanding performance, Zareen out-maneuvered Magno with a rock solid defence. Although the bout seemed closer than the final score-line, Zareen pulled it off by denying her rival a clear shot. "My entire thought process in the bout was to never give up. My opponent had beaten Pinki Jangra in the first round and I just wanted to prove that I could get the better of her," Zareen said. "This win is also my response to all those who doubt my ability. I am just emotionally overwhelmed right now, don't even remember what I did in the ring," added the 22-year-old, who was denied a trial before the Asian Games last year despite being fit and having credible international performances to her credit. Devi, who won a bronze medal in the previous edition of the prestigious tournament, bettered her podium performance with a gritty show against Villegas. The Indian battled hard against her aggressive opponent and did well on the counter-attack to edge past the Filipino for a top finish. On Monday, Pwilao Basumatari (64kg), Neeraj (60kg) and Lovlina Borgohain (69kg) had settled for bronze medals after losing their semifinal bouts. "The key to this success has been stress management. It has been a conscious decision to keep the pressure off them and constantly remind them of their strengths," said India's chief coach Mohammed Ali Qamar, who took over the top position only last month.